Where Did Fortune Cookies Originate? Who invented fortune cookies is a bit mysterious. 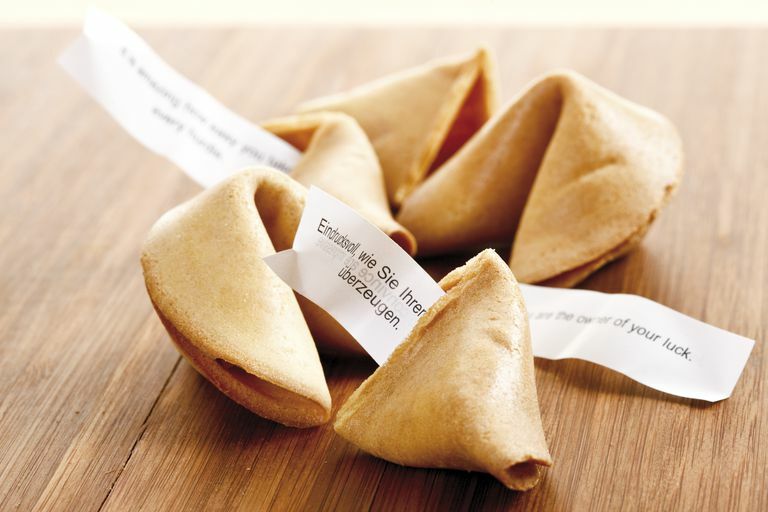 Did fortune cookies originate in China, Hong Kong, Japan, or the United States? The answer is not clear, it depends on who you ask. Messages hidden inside cakes likely go back to the 13th and 14th centuries in China. Messages hidden in Moon Cakes also has a political significance in the formation of Ming Dynasty. Fortune cookies, as they are used today may have originated with Chinese workers who helped to build the railway across the United States in 1849. Happy messages (fortunes) were baked inside biscuits they ate in the evening after the hard labors of the day. Afterwards fortune cookies became common fare in Chinese eateries in the San Francisco's Chinatown. Prior to 1969 fortune cookies were made by hand, until an automated system for the production of fortune cookies was created in the US. Today, most Chinese restaurants in the United States, Canada, and Europe offer fortune cookies to their patrons at the end of a meal. It would be unusual to be given a fortune cookie in China. My husband and I traveled through China in 1988 and never saw or ate even one fortune cookie during our tour. Fortune cookies are not really used as serious divination tools. The messages tucked inside fortune cookies are meant more to be funny, or a way of uplifting your spirit. They are certainly a fun way to spark conversation after dining with your friends. Generally the printed message will be either a future prediction or famous quotation. On the back of the message "lucky numbers" are sometimes given. Even so, a cookie's message can seem quite accurate or insightful. I remember Scotch taping a printed fortune cookie slip on top of my typewriter in the office where I worked so that I would see it often. I sat at that desk for eight hours a day, five days a week. I kept that message adhered to my typewriter for at least a year until the typewriters were replaced with computers. My "fortune" was a particularly fortunate prediction that I liked. This was years ago! This "fortune" may have very well been the first affirmation statement I ever applied to my life. Oddly, I don't remember now exactly what it said, but I imagine it had something to do with having luck in finances or finding the perfect love. Someone (don't remember who) told me once that the fortune found inside your cookie will not come true unless you actually eat the cookie before you open up and read the fortune. I don't care for eating fortune cookies (FYI - I would never turn down a Toll House cookie) but ever since hearing that, because I'm somewhat superstitious, I will always take at least one bite of my fortune cookie before reading the message. My husband happily gobbles up my leftover cookie crumbles along with his cookie. He loves almond-flavored cookies.